« Are there any crystals that can help me stay healthy during this terrible flu season? February 2013: Rhodochrosite–Set Your Heart Free! February perfumes the air with roses and turns our attention to matters of the heart. No matter what your relationship status says on Facebook, I like to think of Valentine’s Day as an inclusive celebration of love, in all of its beautiful forms and expressions. Love is the highest vibration in existence. If there is one universal goal that is written into each soul contract, I believe that it says we are here to open our hearts, to expand love, and to experience deeper and greater levels of love. We enter into the Earth plane with fresh hearts that are open and trusting, but inevitably we run into negative experiences and emotional traumas. And many times we stuff the energy of these experiences deep within ourselves, where they create subconscious patterns that can block the highest and truest expression of our hearts. If we want our lives to be a living love letter from the Universe, we have to face these old hurts and to release them from ourselves. Sting preached it this way: “If you love somebody, set them free!” I say, If you love yourself, set yourself free! Rhodochrosite is a crystalline key for the liberation of your heart chakra. Rhodochrosite looks like a Valentine, with its whimsical swirls and banded patterns that express in varying shades of pink. It can also contain yellow, orange, brown, and gray color rays, and it can be partially or completely translucent. Its beautiful appearance gives us a lot of insight into its energetic and healing functions. 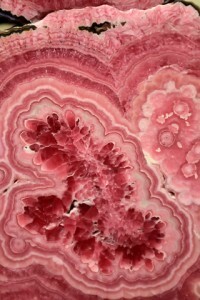 Most Rhodochrosite stones have distinct layers. And encapsulated inside of these bands, you can often find sections of beautiful, circular patterns (see photo). You may have heard the analogy that an emotional injury is like a layered onion, and you have to peel off the layers, one by one, to reach and heal the core pattern. The primary color, pink, resonates with the vibration of love and the heart chakra. Notice in the photo that the deeper shades of pink in Rhodochrosite have a more transparent quality. This reflects the clarity that exists when you are in the deeper levels of love, and it symbolizes the ability of this stone to clear the heart chakra. Most Rhodochrosite also has a yellow-orange tint to it, which (according to crystal expert, Katrina Raphaell) brings in the energy of the solar plexus chakra and bridges the heart and the will centers. This is key to Rhodochrosite’s functioning, because the solar plexus can be thought of as the guard of the heart chakra. If this area is blocked by old fears and hurts, then the heart chakra is not supported in staying open and expressive. Once the solar plexus is clear, it can blend with the heart and bring in the energy of empowerment and manifestation to the emotional body. So to summarize, Rhodochrosite helps us get through the layers and into the root patterns of the heart chakra, it can clear on these deep levels, and it can empower the expression of emotions. When I connect with the inherent consciousness of Rhodochrosite, I am greeted by a tender and encouraging being. Rhodochrosite touches you on very deep and pure levels, reminding you how precious you truly are. It adores you so that you can remember how to adore yourself. When you engage Rhodochrosite for heart healing, it sheds its sweet light into any densities in the heart, cutting through old, pent-up emotions. As Rhodochrosite helps to surface these, it holds your hand and brings in the forgiveness vibration. This helps you to see the higher love and lessons in each situation, which is the key to healing and releasing. Rhodochrosite then helps to gently mend any holes or damage to the energetic areas where the release occurred, normally in region of the heart through the solar plexus chakras. Upon releasing in this way, it is common to feel an exuberant rush of joy that is a symptom of newly liberated emotional energy. Rhodochrosite then supports you in feeling safe to express this energy in beautiful ways. It gets you in touch with your higher self and your authentic feeling nature, and it helps to bring the love vibration of your soul into every aspect of your life. You might find that you are more spontaneous with your expression, sharing your feelings with ease and trusting that you will be cherished, just like a child does. That is why, after achieving heart healing with Rhodochrosite, I suggest wearing Rhodochrosite jewelry. It will continually encourage you with the message that it is safe to share your emotions and to be vulnerable. Many times the restrictions we created in our emotional body occurred because we weren’t able to express how we were really feeling at the time. Instead, we shoved that emotional energy down in an attempt to forget about it and move on. Rhodochrosite is a wonderful support when you need to “get something off your chest.” It helps you to deliver your message in the highest and most loving ways, so that the other people involved feel honored. In this way, it supports you in keeping your heart clear and vibrant and in maintaining the healing progress you have made. Here is a simple and powerful exercise designed to free your heart, called the Rhodochrosite Release. You will need one Rhodochrosite stone, which you should cleanse before and after the layout. Call in your higher self and any spirit helpers you like to work with, and ask for perfect support, guidance, and healing. Lie down and place the Rhodochrosite beneath your sternum, between the heart and solar plexus chakras, and then place a bubble of protective white light around you. Breathe and tune into the loving, supportive energy of the Rhodochrosite, and ask it to help you surface an old memory or emotional situation that has been holding you back. This can be something that happened to you as a child or an adult, or even in a past life, that has been blocking you from expressing your true radiance. Allow it to bubble up from the subconscious, and witness what you are feeling. Take your power to shift this out of your field. Send love and forgiveness to that version of yourself and to all others involved, flood the scene with light, and alter it in any way you’d like. Then ask spirit to help you place the energy of this event into a bubble, and send it to the light to be recycled. End by placing your hands over the Rhodochrosite, and infuse pure love and light into this area. You can repeat this meditation as many times as necessary, whenever you feel the need for heart clearing. And wearing Rhodochrosite jewelry in the following days is recommended to reinforce the healing work you have accomplished and to keep your heart open. So this Valentine’s Day, be sure to honor the most important relationship in your life–your relationship with yourself. And consider giving yourself a present that nobody else can–the gift of pure Rhodochrosite release. I love you all!